There are about 10,000 species of mosses which used to be classified with the Liverworts and Hornworts, but the latter are now in a their own divisions. They are bryophytes which means they do not have a vascular system, having leaves and stems but no roots; attachment to the substrate is by fine colourless or brown hairs called rhizoids. Often the leaves are only one cell thick. They are a common dweller in the lawn and hard landscaping, encouraged by our damp climate. In the woodland garden they form a beautiful carpet and are used extensively in Japanese-style gardens. They are such a favourite in Japan that gardeners there can buy named species at the garden centre to colonise their gardens. The 19th century gardener and writer, James Shirley Hibberd, advised that moss was essential for inclusion in the lawn so as not to bruise the elbows when rolling on the grass! Microscopic examination would probably reveal some of the interesting creatures that can be found associated with mosses. Notably the Tardigrades, also known as water bears. These little, eight-legged animals are virtually indestructible and can survive freezing, total dehydration, radiation, and even a spell in space. Under extreme conditions they become a dried husk which can rehydrate to a living state after decades. Examination of the genome revealed a protein called Dsup that binds to DNA protecting it from destructive forces. Moss is ever-present as the spores float around in the air, invading the grass sward when the fertility is low and the soil is wet. Sphagnum moss has very good absorption qualities when dried, and has been used to make nappies, sanitary towels and wound dressings. During the World Wars many tons were shipped to the front after being compressed into cakes, sometimes using the same machinery that made the munitions. It has mild antiseptic properties and these were boosted with garlic juices. There is some evidence that use as a wound dressing may go as far back as the Bronze age. Bog peat is the dead remains of mosses which have been pickled for thousands of years, but still retain their absorbent properties. This makes peat an ideal growing medium which holds moisture and nutrients that are easily available to plant roots, and despite much research nothing has been found to match it perfectly. Keep the lawn well fed and don't cut it too short, especially when the growth rate is slow in the winter. Improve the drainage by pricking or spiking. Brushing coarse sand over the surface after spiking helps to keep the new pores open. Scarifying can help to spread the moss if it is growing actively, so it might be best to kill it first. This is done with a chemical treatment like Dichlorophen, a weed-and-feed treatment or Lawn Sand. The latter contains Ferrous Sulphate which can be obtained form hardware shops in powder form and is watered on at a rate of 6g per m². (Make up the mixture on a tray or plastic sheet as any spills will leave a rusty stain on paving). When the moss is blackened and dead use a spring-tined rake or a mechanical scarifier to remove it. An electric or petrol driven form of the latter can be hired, depending on the size of the job. This will only give temporary removal as the problem will return if the cause is not remedied, ie. relieve compaction, improve drainage and don't cut the grass too short, especially at the end of the season. An autumn feed with a low nitrogen content will also strengthen the grass to help it through the winter. On flowerbeds a good time to remove it is after a frost which will have lifted it and most species are easily gathered from the surface. However, the moss shown in the lower picture on the right, which resembles a miniture fir tree, has a relatively deep rhizoid which has a tenacious grip so is more difficult to remove and usually brings a clump of soil with it. It can be killed with a weedkiller such as Glyphosate first. Regular loosening of the surface of the soil with a hoe or hand cultivator develops what is called a dry mulch which keeps moss away. Any sort of applied mulch will eventually be invaded in shaded moist areas, but the loose surface makes removal quite easy. On hard landscaping moss can be prevented by regular cleaning. 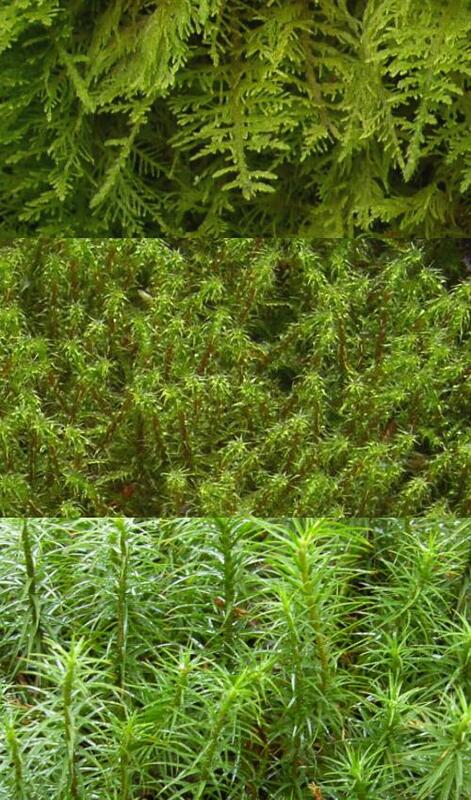 Usually first to develop is a layer of algae, so if this is treated the moss will not arrive. Use one of the many products such as Jayes Fluid or a cheaper option, bleach - widely available in bulk under the name Hypochlorite, a 10% solution which can be diluted 1:4 and applied as a spray or with a watering can fitted with a dribble bar. Sometimes the moss is accompanied by Dog Lichen which grows as greyish, flattened scales. See also Pearlwort, Liverwort and Blue-green Algae which are found in similar areas and conditions.